The signage has gone up and the butcher paper is coming down. At long last, Ocean City's Pure Tacos is set to open its Center City Philadelphia location (1935 Chestnut St., 215-496-9393) on Monday, July 9. In addition to having seating, the shop will offer take-out and delivery options for orders placed over the phone or online. Hours will be 11 a.m. to 10 p.m. Monday through Saturday and 11 a.m. to 9 p.m. on Sunday. You can follow Pure Tacos' Twitter feed or Like on Facebook for information on an upcoming free tacos giveaway. Lots of reader recommendations to pass along this week. Jaime L. let me know that luncheonette Hannah G's in Ventnor (7310 Ventnor Ave., 609-823-1466) has five gluten-free menu items, which are prepared on a separate grill: blueberry pancakes, roasted vegetable cheese omelet, ranchero eggs on quinoa, spinach quinoa salad and a Cajun chicken platter. The kitchen also has a dedicated toaster on hand. Thanks to Jared G. for sharing word that Cherry Hill's The Kibitz Room (100 Springdale Rd., 856-428-7878) is now serving its oversized deli sandwiches on gluten-free bread. 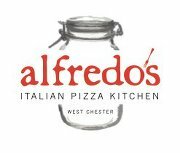 The new Alfredo's Italian Pizza Kitchen in West Chester (34-38 E. Street Rd., 484-315-8685) has a dedicated oven for gluten-free pizza and separate utensils and cookware for pizza and pasta. The restaurant is running a Living Social deal right now for $10 that'll net $20 worth of food and non-alcoholic drinks. Reader Tom P. let me know that there are gluten-free options available in West Cape May at the Cape May Organic Market (120 Park Blvd., 609-884-3200) and at Good Earth Organic Eatery (600 Park Blvd., 609-898-6161). In more second-location news, Underdogs, the franks-and-fries joint in Center City, is planning to open at 1205 S. 9th Street in South Philly. The menu there, as at the original, will include gluten-free rolls. Expanding into Wilmington (2510 Foulk Rd.) this fall is Delaware's Two Stones Pub. The Newark spot offers four gluten-free beers. Now that the lines have died down, Shake Shack is worth a trip for some gluten-free burgers, hot dogs, fries and custard, as I wrote in my review on Tuesday. On the sweet side, Go Bananas Frozen Yogurt in Richboro (1057 Second St. Pike, 215-952-6083) marks its gluten-free yogurt flavors (hat tip to Jennie), as does Spoon Me in Voorhees (900 Haddonfield-Berlin Rd., 856-324-3544)(thanks again to Jared G.). All of the organic frozen yogurt at Yogo Sano in Wayne (1 West Ave., 484-580-8205) is gluten free. If you aren't already doing so, you can follow Gluten Free Philly on Twitter, Facebook and Pinterest. Tips, comments and suggestions are always welcome by email as well. Have a great weekend and holiday too! My new 'Gluten Free Philly' Delaware Dining Guide is available as an e-book download. Featured in The News Journal, the guide provides hyperlinked listings for restaurants, bakeries, markets and attractions throughout the First State, including Wilmington, Newark and the southern resort towns like Rehoboth Beach and Dewey Beach. Updated editions published within 30 days of initial purchase will be emailed to purchasers free of charge. We found a great place to beat the heat! There's a new frozen yogurt place in Jenkintown, U Swirl,where you grab a cub and dispense your own frozen yogurt. On their nutritional info sign it lists which 4 flavors DO contain gluten, and the tags on the individual dispensers state "gluten free" for the flavors that are GF. The owner really "gets it" about cross contamination, and if you ask a staff member for toppings, they will take your cup into the back room and add toppings fresh from the original containers. I expect we'll be there often this summer.